Initiation factor eIF4E and its complex with eIF4G. These structures include the end of a messenger RNA and a small portion of eIF4G. Synthesis of proteins is a complex process, and cells need a way to get it started. A collection of initiation factors brings together messenger RNA, ribosomes and the first transfer RNA, setting everything up to begin construction of a new protein. In our cells and in other eukaryotes, most of the messenger RNA molecules are capped by a methylated guanine nucleotide that is attached backwards at the beginning of the chain. Initiation factor eIF4E (PDB entry 1ej1) has the job of recognizing this usual cap structure, and then directing the assembly of the rest of the initiation machinery on the messenger RNA. Our cells often use flexible regions in proteins to build complexes for signaling and recognition. When the protein is by itself, these tails are disordered, but when they form their complexes, they fold into small interacting local structures. 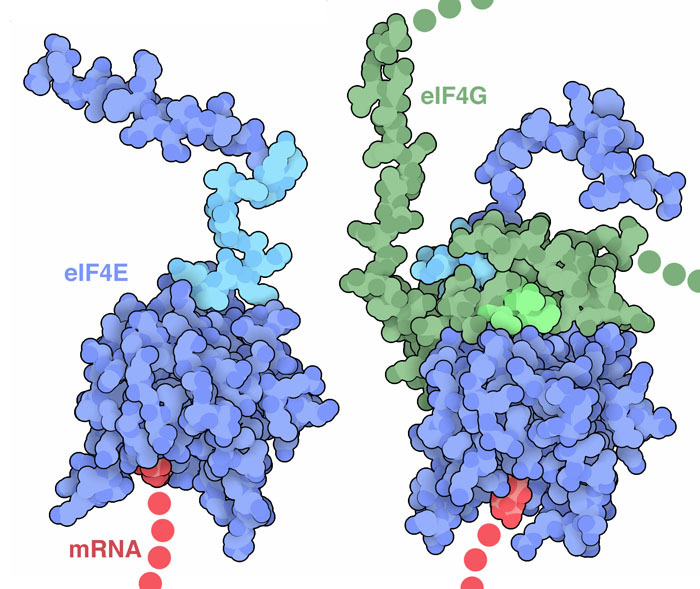 eIF4E (PDB entry 1ap8) is composed of a compact domain that binds to the mRNA cap, and a long, flexible tail. 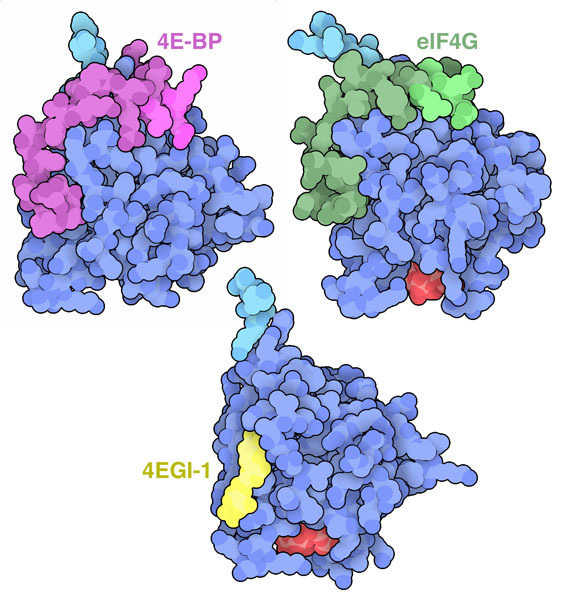 When eIF4E interacts with eIF4G (an initiation factor that acts as a scaffold for many other initiation factors), a portion of this tail folds up and interacts with a similarly flexible region of eIF4G (PDB entry 1rf8). Cancer cells grow very quickly, so they need ways to circumvent the normal cellular controls on growth. One way they do this is through oncogenic changes in the machinery that regulates protein synthesis, for example, by developing an overactive eIF4E. Medical researchers are now targeting eIF4E, developing inhibitors that can slow the action of eIF4E and block the accelerated growth of cancer cells. Complexes of eIF4E with initiation factor iEF4G, 4E binding protein, and the inhibitor 4EGI-1. The hydrophobic motif is shown in brighter magenta and green, and the structures include only portions of each of the proteins. Structural biologists have been looking closely at the interaction of eIF4E and its partners. The protein is stored in an inactive state with several 4E binding proteins. These proteins are released upon phosphorylation when eIF4E is needed, and eIF4G binds in the same place. PDB entries 1ejh and 1ej4 first showed how these proteins bind to eIF4E, using a similar hydrophobic motif. 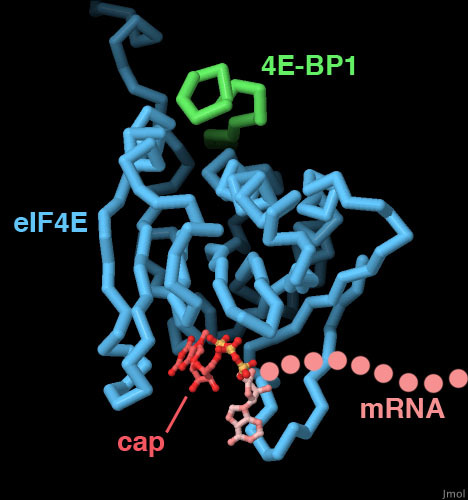 Two later structures, PDB entries 5t46 and 4ued, looked at a larger segment of eIF4G and 4E-BP, showing that a flanking region is also important for the conditionally-ordered interaction. The trial anti-cancer inhibitor 4EGI-1 binds in the same location on eIF4E and blocks binding of these partners (PDB entry 4tpw). PDB entry 1wkw includes the tip of a messenger RNA, including one nucleotide and the cap. In the cap, a guanine is attached backwards from the normal chain direction, and includes an extra methyl group. The structure also includes a short segment of a 4E binding protein, including the hydrophobic stretch that is specifically recognized by eIF4E. To explore this structure in more detail, click on the image for an interactive JSmol. You can explore the structures of many other initiation factors by searching in the main RCSB site for “translation initiation factor”. Try looking for others that have disordered tails. If you’d like to see a longer piece of RNA with a cap, look at PDB entry 6c6k.